Former First Lady Nancy Reagan has died at home in California at the age of 94. 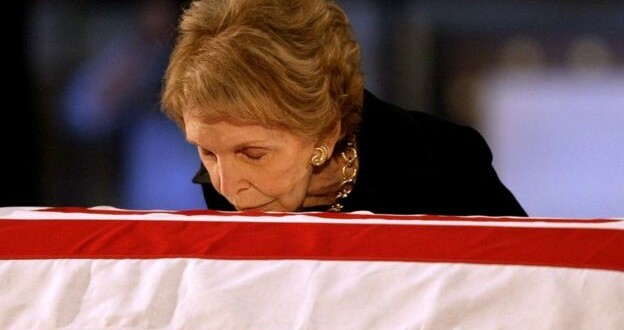 Mrs Reagan, who had been living in Bel Air, Los Angeles, died of congestive heart failure, the Reagan library said. Her 52-year marriage to Ronald Reagan was once described as the US presidency’s greatest love affair. From 1981-89 she was one of the most influential first ladies in US history; initially criticised for an expensive renovation of the White House, but later becoming a much-loved figure. She will be buried next to her husband, at the Ronald Reagan Presidential Library in Simi Valley, California, the library said in a statement. 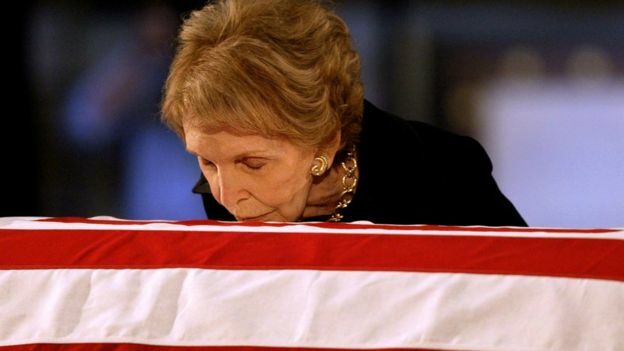 US President Barack Obama said Mrs Reagan “redefined the role” of First Lady. Former Republican presidential candidate Mitt Romney tweeted that “with the passing of Nancy Reagan, God and Ronnie have finally welcomed a choice soul home”. Like Ronald, Nancy was a former Hollywood performer who made it all the way to the White House. As Nancy Davis, she was an actress during the 1940s and 1950s and married Reagan, a prominent film actor, in 1952. She served as first lady of California during her husband’s stint as California governor from 1967 to 1975 before moving into the White House after his decisive victory over Democratic President Jimmy Carter in 1980. As first lady, she sought to emulate the style of one of her predecessors, Jackie Kennedy. To this end, she extensively redecorated the White House, and accepted designer dresses worth $1m (£600,000) and a 4,732-piece set of china worth $209,000. But this spending spree provoked a huge outcry from people outraged by what they saw as profligacy and waste while millions of Americans were losing their jobs. Public opinion was also swayed by accusations that Mrs Reagan had a frosty personality, often consulted astrologers, and ordered the dismissal of White House chief of staff Donald Regan in 1987. “I see the first lady as another means to keep a president from becoming isolated,” she once said. Nancy Reagan’s best-known project as first lady was the anti-drugs “Just Say No” campaign. After her husband died of Alzheimer’s in 2004, she became a champion for Alzheimer’s patients, raising millions of dollars for research and breaking with fellow conservative Republicans to argue for stem cell studies.